No one would have predicted how the young Peter Meineck would turn out. At 15, he was expelled from his tough South London boys' school, populated by assorted ruffians, and went to work as a laborer. At 16, he signed up for the Royal Marines—his only goal at the time. But he was a smart kid, and in 1985, "when England was waking up to the idea of letting the non-upper classes into university," Mr. Meineck began studying at University College London. There, he met "an amazing professor," who took one look at his shaved head, a relic of the Marines, and said, "You should study Aeschylus, because he's a soldier like you." He did. "I thought, wow, you can be a soldier and a great playwright," Mr. Meineck recalls. "And I found I loved Greek drama." Peter Meineck at a Page and Stage event. Today, along with teaching classics at New York University, he is the founder and artistic director of the Aquila Theatre, which tours classical plays to some 65 U.S. cities a year, and an evangelist for the ancient Athenian playwrights. "The Greeks gave me access to everything," he says, "to education, to the upper classes, to the business world, to the legal world . . . I felt I could compete with everybody." Now, with a program called Ancient Greeks/Modern Lives: Poetry-Drama-Dialogue, Mr. Meineck, who moved to the U.S. in 1994 and became a citizen in 2007, is embarking on his biggest effort yet to ignite in others the passion that animates him. Leading a team that includes scholars from around the country, he will stage free dramatic readings from 10 plays—including Homer's "Odyssey," Sophocles' "Ajax," and Euripides' "Trojan Women"—for the public, especially combat veterans, inner-city residents and rural communities. The programs, set to take place at 100 public libraries and art centers in some 20 states, will be followed by "town-hall" discussions examining the connections between the classics and contemporary America. Also on offer: scholarly lectures, reading groups, master drama classes and a resource-laden website. "Our job is to say, this isn't rarefied and dusty," Mr. Meineck says. "It speaks to us." Given the bedraggled state of the humanities today, that sounds like a tall order. Yet this spring, the National Endowment for the Humanities gave Ancient Greeks/Modern Lives a Chairman's Special Award of $800,000, the largest NEH grant ever given in theater, and one of its largest single grants ever. And that followed a $292,585 grant to the pilot project, called Page and Stage and based on Homer's "Iliad," in 2008. It all grew out of a dinner conversation. Aquila had been winning small annual grants from the National Endowment for the Arts for its productions of Shakespeare, and in 2005 Dana Gioia, the NEA's chairman at the time, asked Mr. Meineck to do a show at the White House. Aquila staged a "rather risqué" version of "Much Ado About Nothing" in the East Room (Mr. Meineck says that he is sure Laura Bush enjoyed it and that President Bush seemed to). At the dinner afterward, Mr. Meineck was seated next to Bruce Cole, then chairman of the National Endowment for the Humanities, who suggested that Mr. Meineck contact his staff about a project. There, Mr. Meineck learned of NEH's interest in involving libraries, which he'd never considered before. "I went to the Brooklyn Public Library, and I saw it was full of people. I thought this was a great way to get new audiences for theater." Together, he and the NEH came up with Page and Stage, which would take Book One of "The Iliad," performed by Aquila actors, to libraries in 16 cities. The program also offered multisession reading groups, workshops with the actors, films and other events. 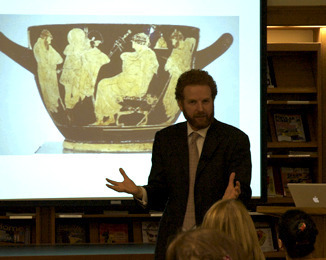 To keep it highbrow, Mr. Meineck drafted classics scholars to write explanatory essays and lead the discussions. Each library chose a theme, from four—loosely described as using ancient texts for modern messages; the search for identity; the catharsis of crossing into the unknown; and the Trojan War as history and myth. "We thought we'd get 100 people, and we'd get 500 to 700 people at each place," Mr. Meineck says. They were all ages, races, demographic groups. They were hungry for "more discussion," though comments varied substantially, from morality to women's rights to the meaning of democracy. "Saying passionate things within the context of historical texts is a great way to communicate," he says—it takes the animosity, the personal, out of the dialogue. At the first Page and Stage program, in Delray Beach, Fla., Mr. Meineck noticed many ex-soldiers in the audience. Recognizing that potential, he teamed up with the Philoctetes Project, which stages plays for combat veterans, and in April 2009 Aquila actors performed scenes from Sophocles' "Ajax" and "Philoctetes" in New York. At the open-mike discussion afterward, Mr. Meineck recalls, a veteran stood up. "He said, 'I've never spoken about this before; I never knew a play was written about me. I am Ajax; I wanted to kill my commanding officer.'" "If you want to understand catharsis," Mr. Meineck continues, "watch veterans watch a Greek play." Along the way, Mr. Meineck had added other locations to his initial plans for Page and Stage, so it was not a big step for him to apply for a bigger NEH grant that would take more classical literature to 100 cities. He's had to trim back the drama, though: At each Ancient Greeks/Modern Lives event, actors will simply read four scenes, taking about 45 minutes. Then a scholar will lead a discussion centered on one of four locally chosen new themes: "Stranger in a Strange Land: Encountering the Other"; "Homecoming: The Return of the Warrior": "Rites of Passage: Changing Worlds, Transforming Lives"; and "From Homer to Hip-Hop: The Art of Storytelling." "There's a thirst for this," Mr. Meineck insists, "but it has to be of good quality." He plans to engage well-known actors to launch the full program next year in Los Angeles, New York and Washington. He knows several, such as Gary Sinise, Bill Pullman and Olympia Dukakis, who would likely help, depending on their schedules, and he'd like to enlist more (maybe Jennifer Aniston, who's partly of Greek descent). And in the end, after the last performance in April 2013, "I'd like thousands of people to feel like they've learned something about the Greeks, and to be empowered to go learn more," Mr. Meineck says. "And I'd like to really invigorate libraries and arts centers, to let them see they can have serious high-end programs even if they're tiny."